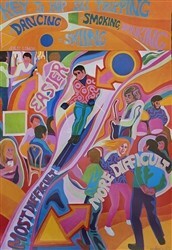 Size 22 x 28 inches. 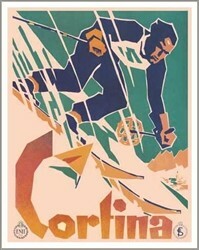 Cortina Vintage Art Deco Ski Lodge Poster. Cortina d’Ampezzo is a town and commune in the southern (Dolomitic) Alps located in Veneto, a region in Northern Italy. Located in the heart of the Dolomites in an alpine valley, it is a popular winter sport resort known for its ski-ranges, scenery, accommodations, shops and après-ski scene. After the scheduled 1944 Olympics had been cancelled because of WWII, it hosted the 1956 Winter Olympics as well as various world cup events and motion pictures. Much of 1963 classic The Pink Panther, the progenitor of the series, was filmed in Cortina. 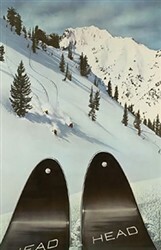 One of the memorable James Bond stunt sequences in 1981’s For Your Eyes Only, gunners on spike-wheeled motorcycles chasing Roger Moore on skis, was filmed on its slopes, as were several scenes in the film Cliffhanger. It is also known for its Jet set and European aristocracy crowd. Size – 22 x 28 inches.